Sneaking by our house on the road is officially over. 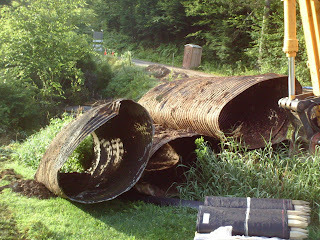 There is a large hole where the pipes once crossed the road. 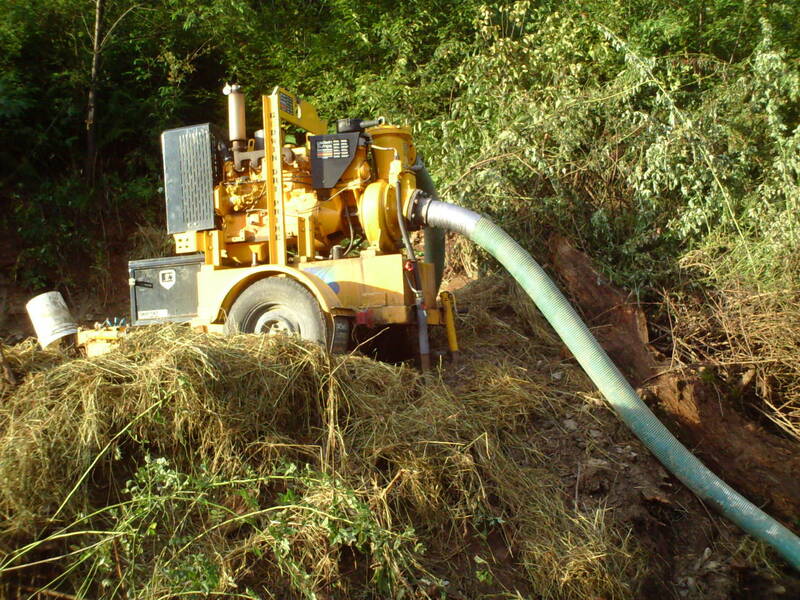 Working in such a small area is a tricky operation. First they had to cut accesses for the pump to divert the stream. Then they cut a work road down to stream and dammed up the stream. 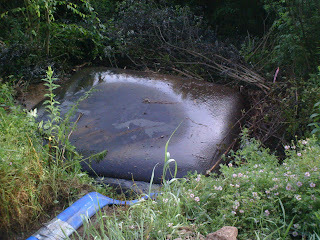 Everything gets covered with straw and silt bag are put up to stop any erosion into the stream. 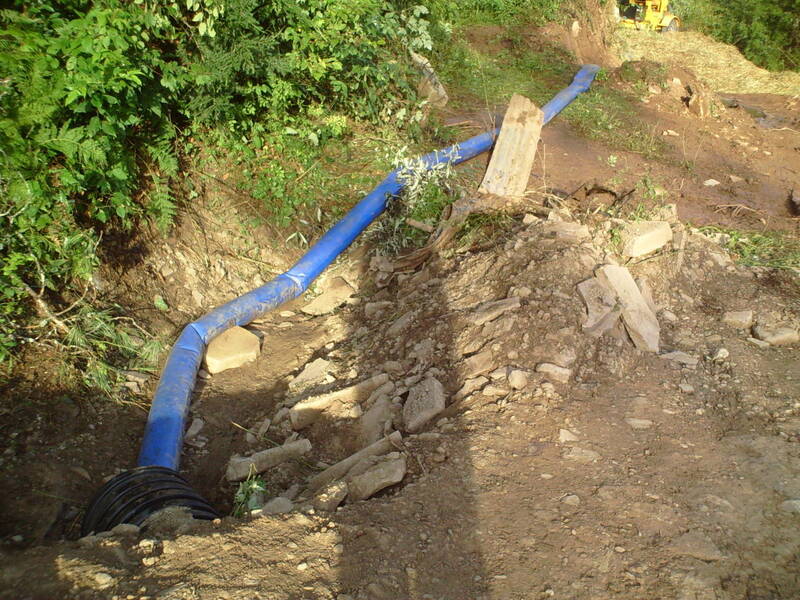 They put another pipe across the road downstream from the work to pump the water up and over to a large bag. 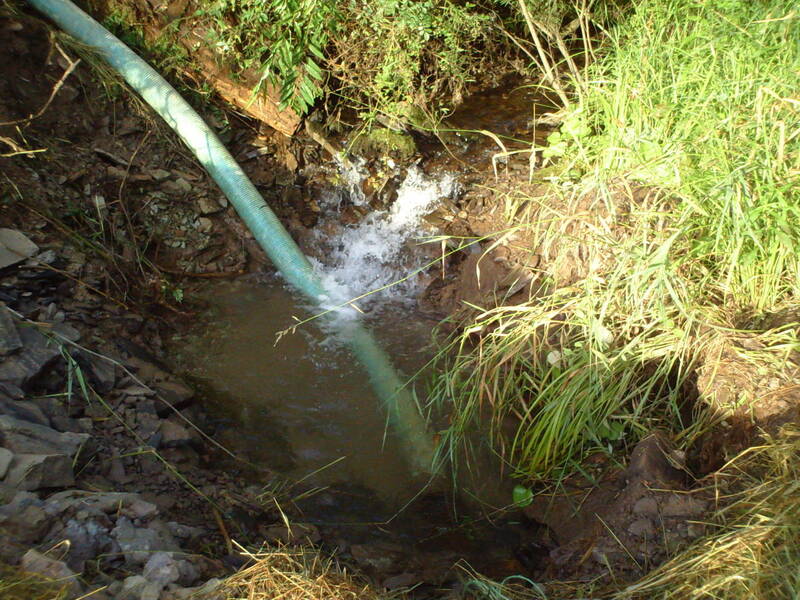 This bag fills and gradually seeps the water back to the stream. Hopefully, we won't get any big storms during this project, because I don't think there system would handle some of the water I have seen come down Buck Run. I plan on taking progress pictures of the work on a regular basis to show you all where it is at. 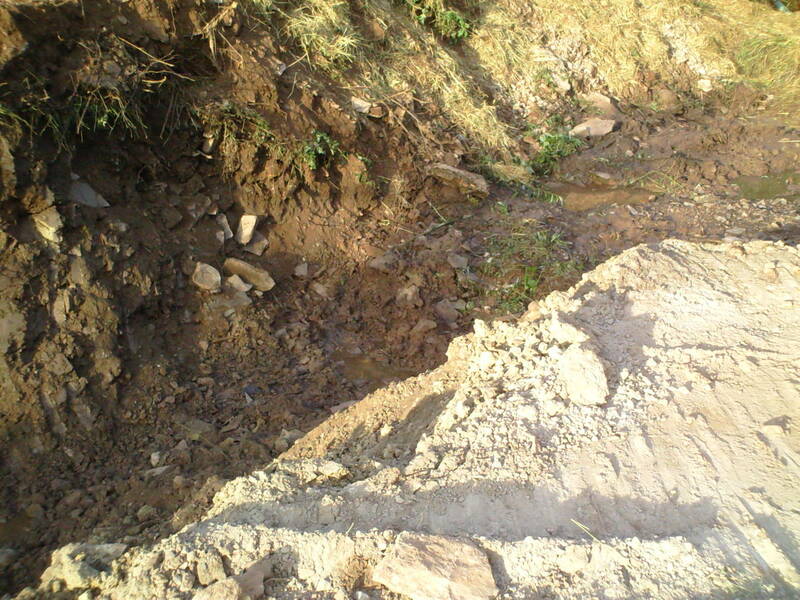 I am expecting 2 months of the loss of my road. 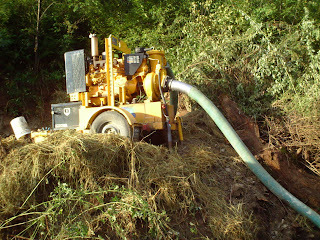 The worse part is the noise not only while they are working but the pump runs constantly and it is very loud. We aren't used to having so much noise so close. I turned the fan on last night to try and drown out some of the pump noise it worked a little. They are also using the dirt they dig out to make the road wider and a little straighter shot over the bridge. It seems we might have a very large parking area in front of the house based on how wide it looks already. Well, that is the news that affects us. Small in the scope of the world, but huge change in the once quiet middle of the woods. Mountain girl, Paula, logging out. Ace a friend of mine and I went down to the first ever Canyon Marathon to help. 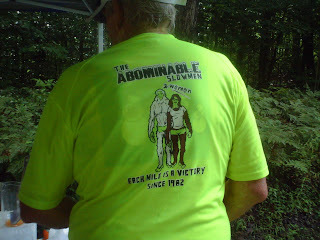 We were designated helpers at an aid station and handed out water, Gatorade, and snacks. 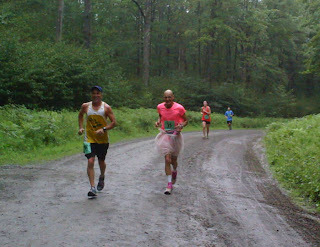 The day started pretty miserable with constant rain and the road was quite muddy for the entire event. They started at 7 am and by 10 am the rain had slowed, but we stood in a very muddy spot all day. 250 runners of all ages passed us twice at about the 10th mile out and 17th mile back. There are quite a variety of people who run from the die-hard serious competitors to the people who just enjoy completing the race and being part of a fun day. Some people came in groups and seemed to be having a sort of party along the way. They knew how to enjoy life and shared it well with every step they took. You could tell by watching the runners they all enjoyed the race in their own special way. I recorded a couple of standouts. 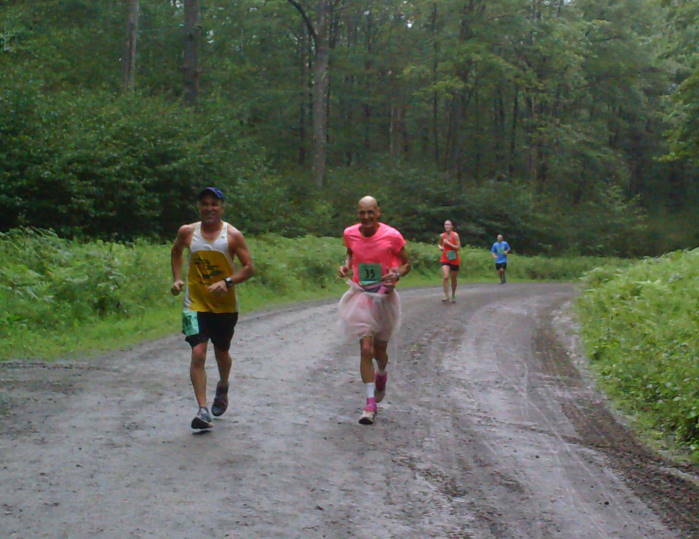 First person who was hard to ignore was this lanky, tall, bald guy running with a pink shirt and a tutu. He seemed to be holding his own kind of style in about the middle of the pack and definitely, gave me a reason to smile. 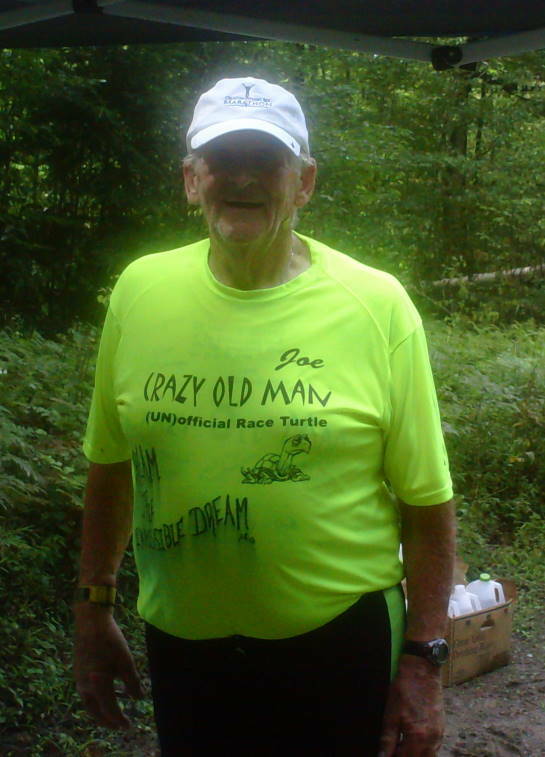 The last but not least of the competitors was Joe Brockway, who just turned 80 and finished the race at just over 8 hours and 10 minutes for 26 miles. Many people his age can barely make it from one chair to another let alone run an entire marathon. He calls himself, "The Abominable Slowman," and is the very unofficial race turtle of any race he runs in. 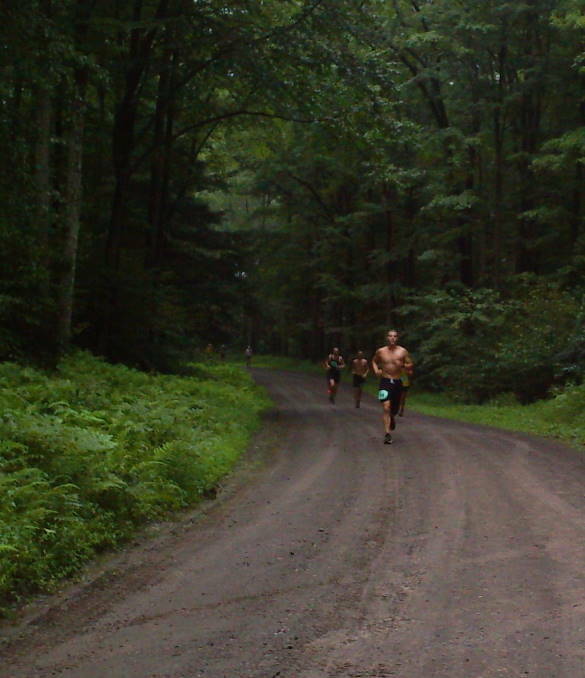 Many of the seasoned runners said this marathon was a lot harder than any they had ever run in with the long hills. But they also commented it was one of the more beautiful runs through the scenic forest. The ending was a very tough 3 mile uphill and my hat goes off to all who finished. I will say this for the runners they are all very thankful and generous with their praise to us volunteers for helping them along the way. So, if you need a couple hundred thank-you boosts, volunteer at one of these runs it was very enjoyable. I am a long way from being able to run 26 miles, but they have promised a half-marathon next year and 13 might just be something to aim for in 2014. You can find the list of the finishers on this LINK Mountain girl, Paula, logging out. 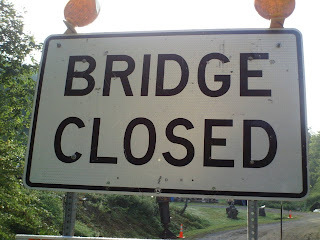 Quick update they put all all the bridge out signs, but the bridge work won't actually close the road until next Monday. So one more weekend of freedom for all you Leetonia lovers. Mountain girl, Paula, logging out. 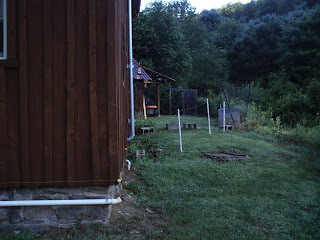 Yesterday I put the electric fence back up around three sides of the house. The Garage effectively blocks the rest of the yard, unless the bear decided to try to go over the wire fence in another location. 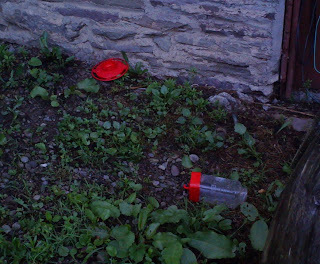 As of this morning nothing was touched so I am guessing the bear got the hint. Game on Mr. Bear! The road closed signs can be pretty much ignored for the weekend as they promised me they wouldn't dig until Monday. Their proposed detour is crazy. It starts at Leetonia Rd/414 and takes you up through Morris/Wellsboro and back down 6 to Gaines. Really. Not necessary. You have total access to Leetonia it is really only the last mile to my house up Buck Run you should stay out of next week. 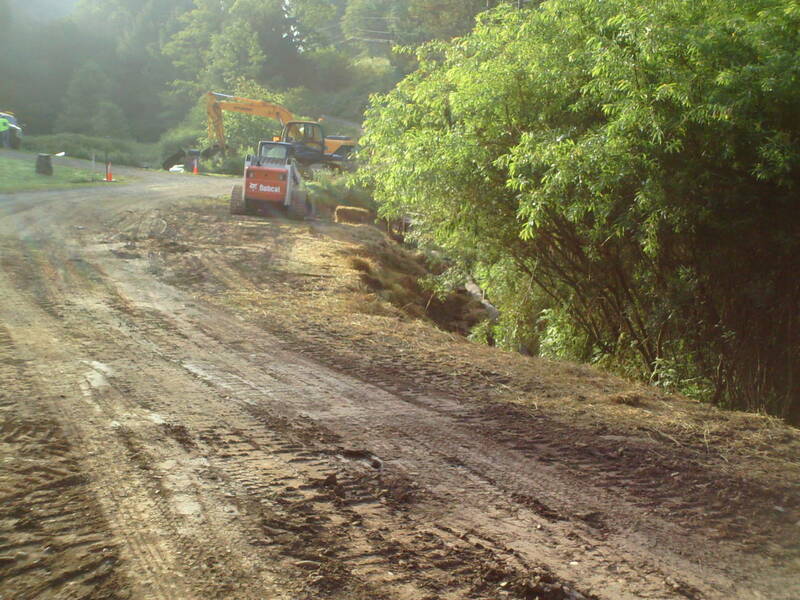 And getting around the bridge out to go to Galeton/Gaines side should just be a minor Francis Leetonia/Cushman Road loop if they finish putting the gravel on the other side of the mountain by then. Don't try Cedar Mt road during the week as the pipe line trucks will scare the religion out of you. I thought logging trucks were bad, they look like babies compared to the trucks hauling pipe. So enjoy the last weekend of freedom past my house. 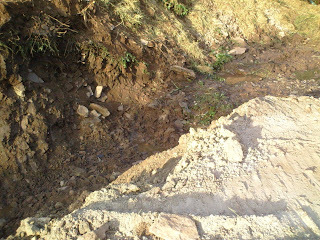 I am sure the road won't be open before September again once they start. 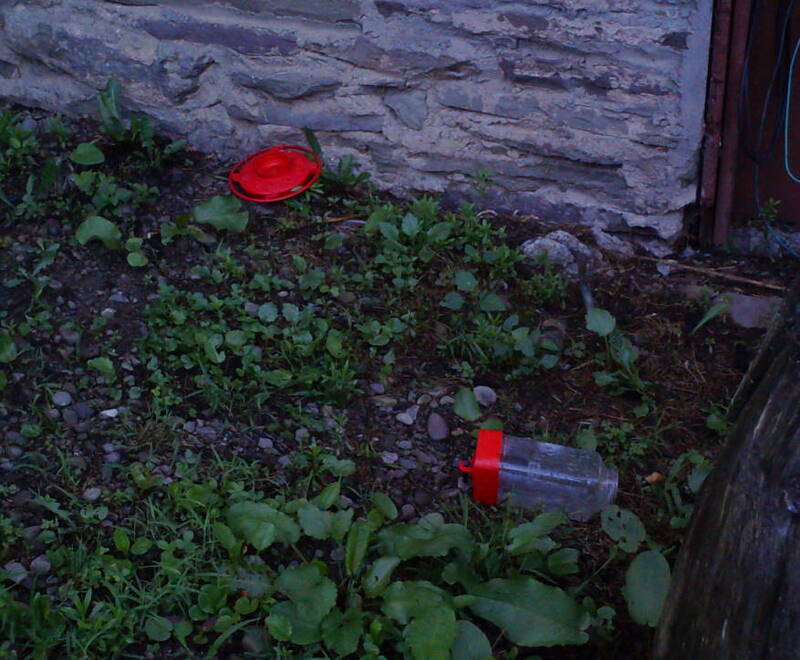 :( Even in Leetonia we aren't away from the joys of summer construction. I will keep you updated on the progress. Mountain girl, Paula, logging out. Well last night started when I came home from work with Lee outside a flashlight pointed toward me. I wondered what was going on. "Do you see a bear?" she said. 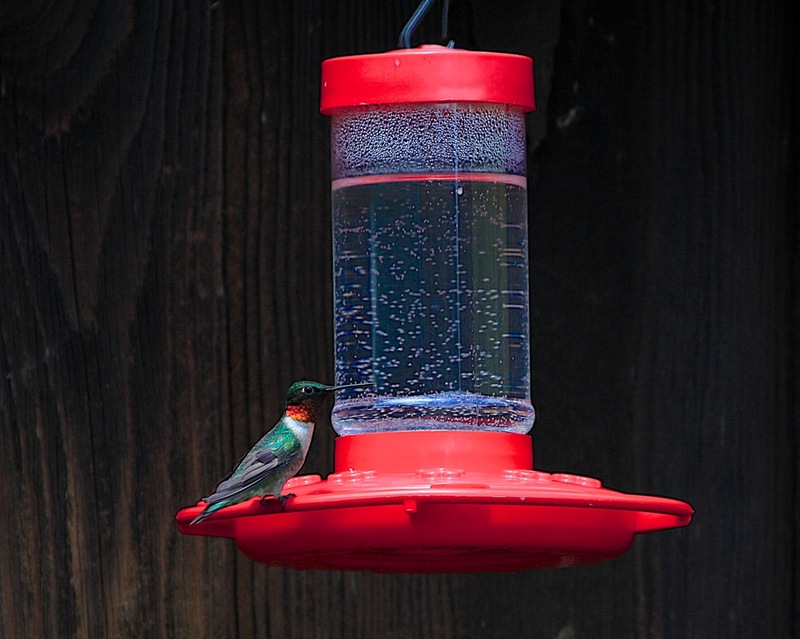 "He was just out here getting into the hummingbird feeders. I chased him away from one and he ran to the next." "No," I replied, "I usually watch with the lights of the car as I pull up for them." That last part was true as there is nothing worse then walking into a black bear in the dark. They are so hard to see at night and there aren't street lights up here. Well it didn't take long after I was inside for the bear to reappear in the window start drinking the feeder. 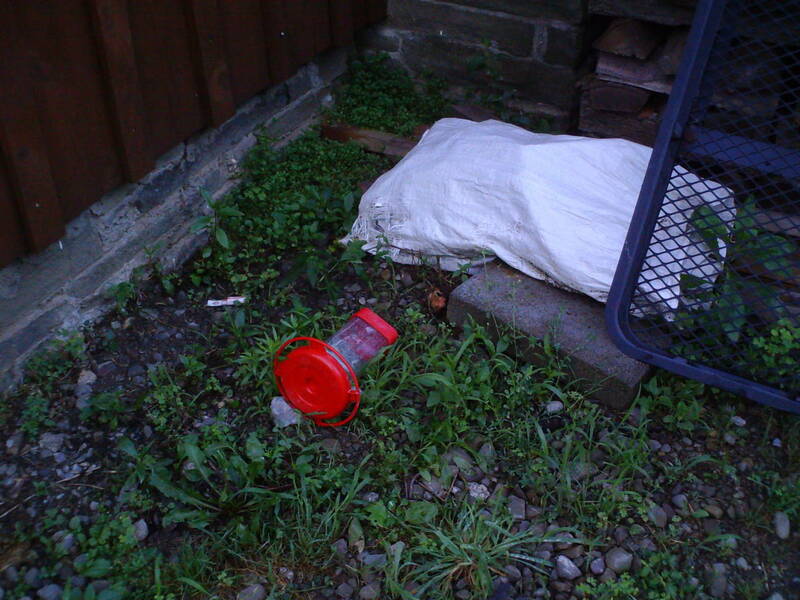 I grabbed the big drum and took it outside; I yelled at him pounding it loudly. He ran toward the front of the house and I followed. By this time Lee came out with the flashlight and he was at the road. He had stopped in the road to look at us. His eyes reflected green in the flashlight looking more like a monster from a bad dream than a 400 lb bear. We kept beating the drum and yelling until he ran down the road out of sight. "Hopefully, he won't be back." I told Lee. I turned my concentration to the clock and realized I only had two more hours to be under sixty years old. For some reason this birthday coming was bothering me more than most. I said goodnight to the cat and let the dogs go out one last time then headed to bed. About an hour later I was awoken with Leo's loud half howl, part growl bark. The bear was back. I trudged downstairs in my underwear and sure enough there was his ugly snout back at the hummingbird feeders. Speck, I guess was too tired to get up and stayed on the couch wrapped in his blanket. I ran out the door yelling with the flashlight. He dropped down but didn't go far so I continued to yell at him until he moved down the hill. With a full-moon now out it was much easier to see him. My confidence level in eliminating the bear tonight was definitely fading. I looked at the clock. Happy Birthday to me! I fell back asleep and was again woke up very early in the morning just before dawn by a noise and Leo's grumbling again, but he didn't seem as upset and I couldn't wake all the way up. That was a big mistake. 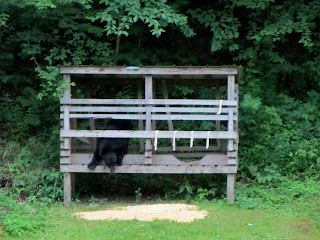 When I finally got up this morning I saw what the bear had been up to. 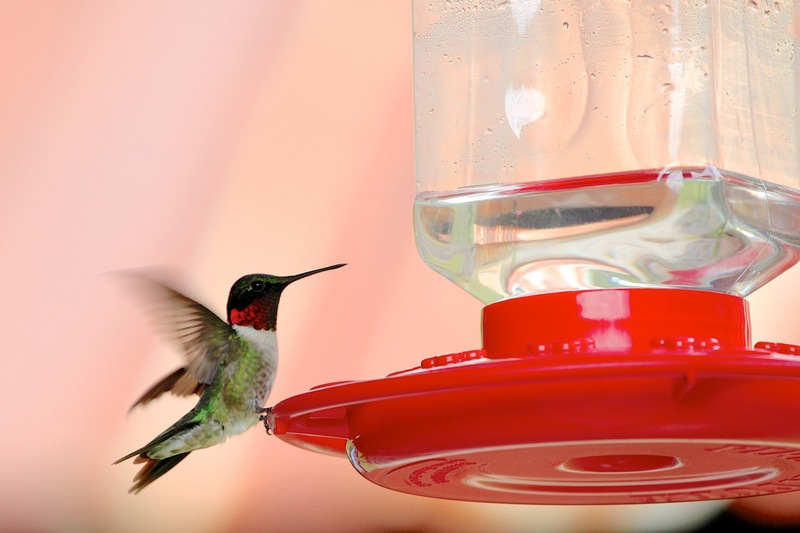 He had drained all 17 of Lee's feeders knocking many of them down. 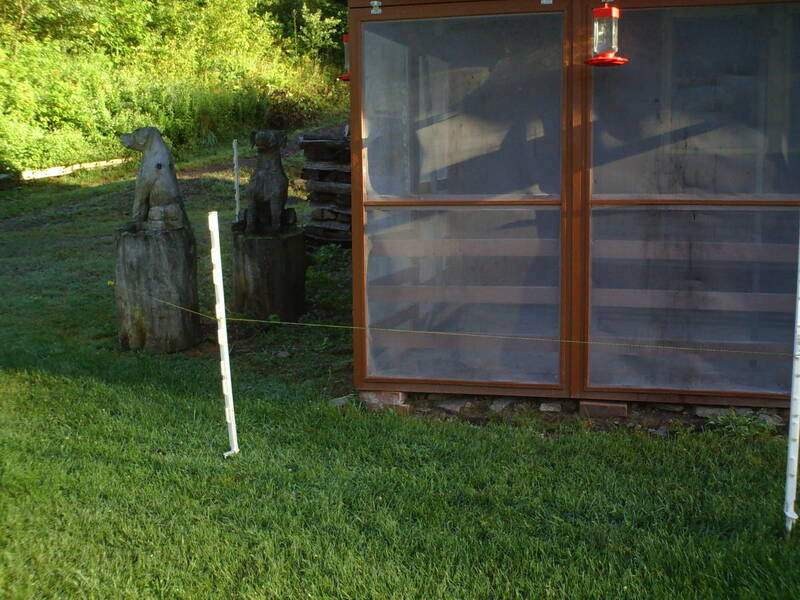 This included the ones in the fenced back yard, which he had to climb and destroy the fence to get to. 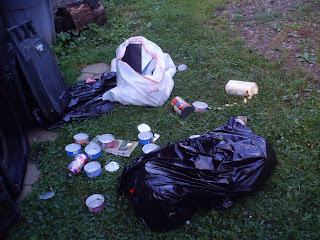 Then to add a little more fun, he opened the garbage cans and spread the garbage all around. I found the last bag half way up the hill. The poor hummingbird who are hatching now awoke to little if any food they were fighting each other for it. The new babies didn't fair well. 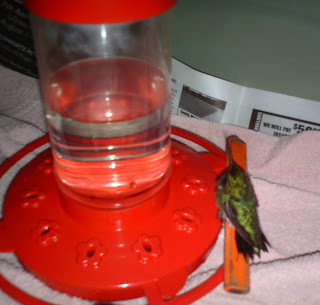 We found one dead in the front and one injured who is now in our Leetonia Hummingbird Hospital. Lee had not wanted to deal with the electric fence again this year, but it appears the bear has given us no other options. So for my birthday I will be stringing wire to retrain this bear back to his normal habitat feeding and away from our not so free handouts. Mountain girl, Paula, logging out and picking up the pieces. On July 28th, the first Grand Canyon Marathon will be held. Part of it will run down Painter Leetonia Rd. a mere five miles from my place so I will probably walk over and watch a bit. I hope for their sake it is much less humid and hot than it has been. Just walking in this weather is a challenge let alone running. I am putting a map of the run down below and you can use the flyover feature. My map is a little off distance wise but you get the idea. The race starts at 7 am and they only allow 6 hours to finish so it won't be a causal walk in the park. Here is there web site for anyone interested in entering: Marathon If this isn't long enough for you they are doing an Ultra-Run 100k or 100 mile on Sept 7th. on Rails to Trails. The Ultra-Run down the Rail to Trail will be easier as far as elevation change, but a much longer distance. Also heads up for those of you coming to the area avoid Elk Run/Cedar Mt Road as they are running pipeline trucks up and down loaded with pipe. Lee met one last week and said it was not a very pleasant experience. The bears are out and about a lot lately. I have seen one everyday going in and out of the woods for last three days. 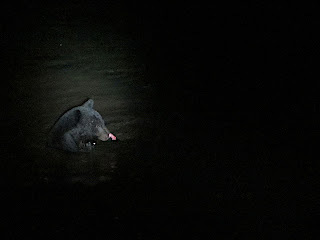 Yesterday, I saw Snaggle Nose on the road at 1 PM just a couple hundred yards down from the house. He didn't want to get off the road and I worried the big bear might have a heat stroke before he finally jumped down to the creek. It got near 99 yesterday in Wellsboro and 94 back here along with similar humidity numbers. I had to look at snow pictures yesterday just to cool off. Today won't be better but they are promising a little break for the weekend. I hope they are right. Mountain girl, Paula, logging out. One day my grandpa and I went to the Galeton Hardware store, which also had lumber he bought over $100 worth of wood(which was a lot back in the mid-sixties). We brought it back and proceeded to build a three-story tree house just above the house. 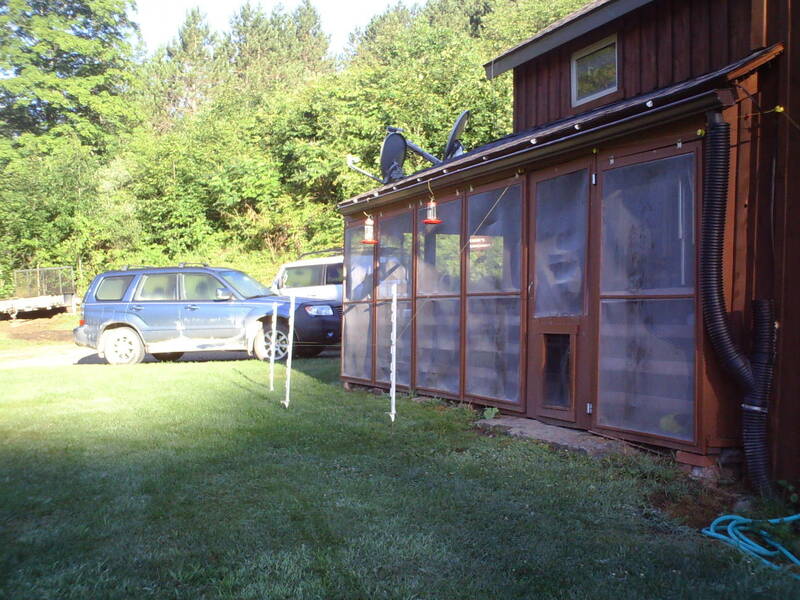 It was built on four legs each sixteen foot long and we used left over lumber to side it and used a few salvaged windows to finish it. 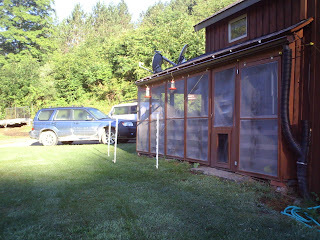 The first year we built the top floor then added the other two in following years. Each floor had a trap door to the next. At one time we even hooked a phone line from the tree house to the house and would ring down and talk to grandma. It was a very old hand crank phone no dial tone on this one. As a kid I would sleep in it overnight with my dog tied to the bottom to protect me from my imaginary enemies of the dark. Now and then she would bark and jump up rattling the chain, which added to the excitement that something might be out there. 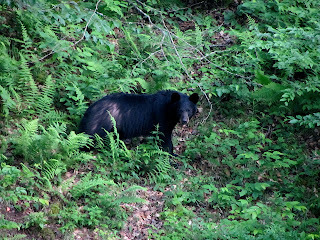 Even though it was a deer wandering by, I could imagine a large bear prowling outside or worse. In the 60's there weren't a lot of bear, in fact as a kid I never saw one. 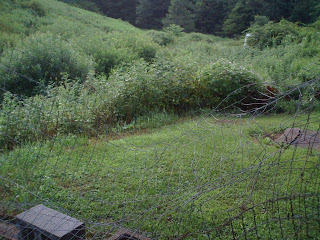 There were hundreds of deer covering the mountain and keeping the brush to a minimum. 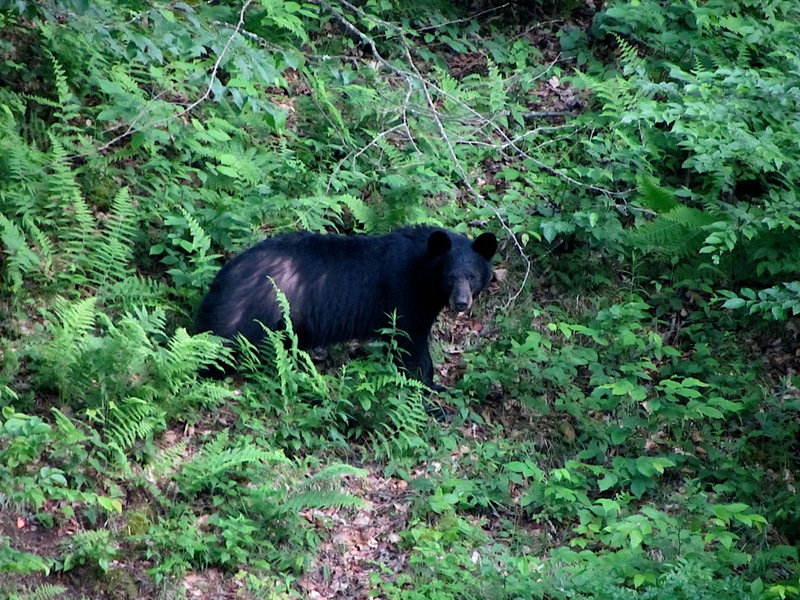 Now there are many more bear than deer and the brush is taking over the mountain. It would be hard to walk were the tree house once stood without a brush cutter. 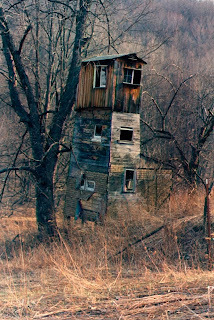 Thanks to Kim Reese I now have a picture of our old tree house. This picture was taken sometime much later than when we built the tree house as you can see it is weathered and some of the singles are coming off. I am guessing sometime in the early 80's. 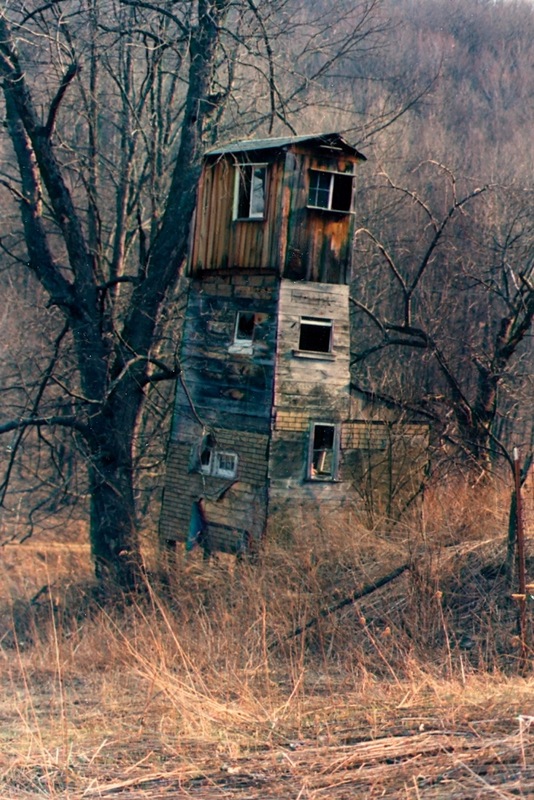 I did find out much later my grandfather used it as a deer stand and for years I thought he built it just for us kids. That may explain why he was willing to spend so much money to put it up. Still it did provide hours of enjoyment for us kids looking out high over the property in our own little kingdom. The PennDot people stopped in today and it looks like they will be setting up in our front yard on the 24th of July. So for all you people coming up this way the road will not be closed until the weekend of the 27th at the soonest. Once it is closed it will not be open again until sometime in September. The heat and bugs are bad right now so it won't be a fun job for them working in the direct sun and being attacked by hoards of biting bugs. Mountain girl, Paula, logging. Last week I said goodbye to the old van I used in 2002 when we first moved up here. It was a great work truck for Illinois, low to ground, good gas mileage, and would hold 11' long stuff. 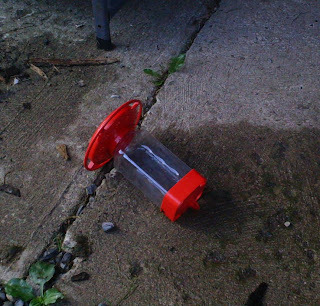 But I quickly learned it couldn't handle the mountains of Leetonia. Even the slightest slope when wet would make the tires spin. So I retired it to a storage unit for my tools and various things. 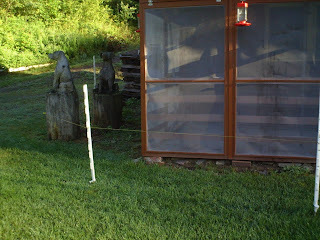 When I used to feed the birds I kept bird seed in it and the bears often pawed at it looking for a way to open the doors to find treasure. This year it started to leak and its water proof days as a storage unit over a friend of mine Phil Dudkin helped me haul it to the salvage yard. Turns out it was worth $420.00 dead. Since, I had only paid $500 for it, I figure it served me well with little loss. The brush around it had started to devour it and it took a bit of chopping to get it out. I have realized how much the wet weather has made the brush grow up near the house and my next project will be cutting it back as fire safety. We got a couple of cooler days this week, but the humidity is still with us and it is promising to go back up in temperature next week. Not the best outdoor working weather. Along with the heat and humidity the bugs have been bad as well. From now until September expect to see a lot of Bears out bulking up eating berries and any handouts they can find from campers. Seems like once September comes and they hear shooting they make themselves a bit scarcer. The birds are still chirping even before sunrise and the hummingbirds are in full swing keeping Lee busy filling feeders. 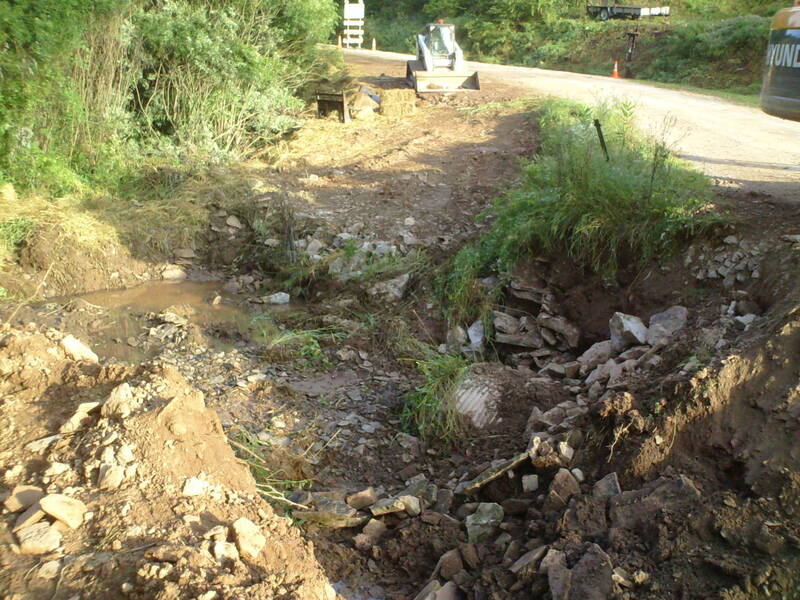 Looks like PennDot will be tearing the bridge out in front of our house next week sometime. 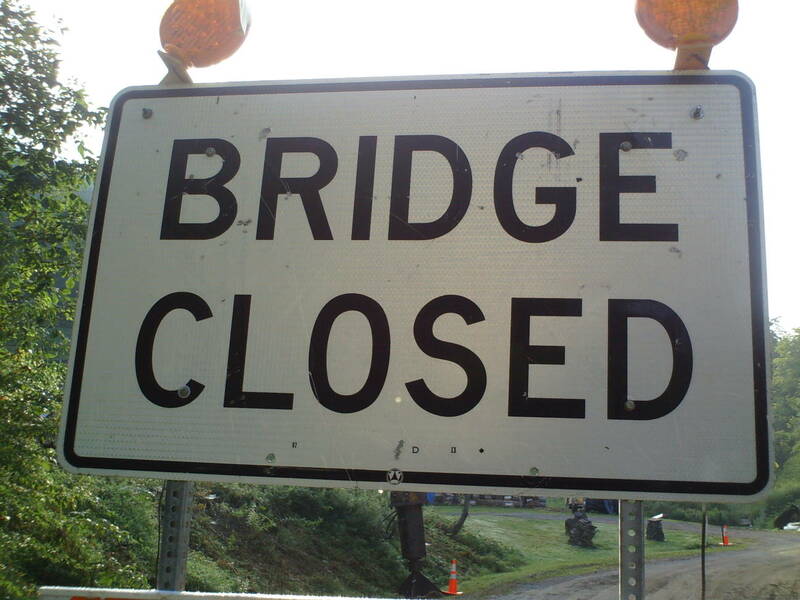 They expect to close the road for six weeks. I will let you know when they show up. Make sure to enjoy Summer, it won't be long until the cold comes back. Mountain girl, Paula, logging out. Over the weekend, Kimberly Reese came up to Hooke's cabin. Hooke bought the place from her grandfather, John Reese's estate. John Reese was the founder of Reese's Candy and the famous Buttercup, which he generously gave out to us kids during the summer. Kimberly has professional photography equipment, which explains why these pictures are so much better than anything I could take with my little web camera. In only two days time she got pictures of three different bears including the "Famous Leetonia Snaggle Nose," whose deformed face and size is enough to frighten most city people. 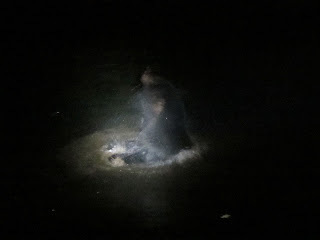 He showed up and night and took a little swim in the pond. 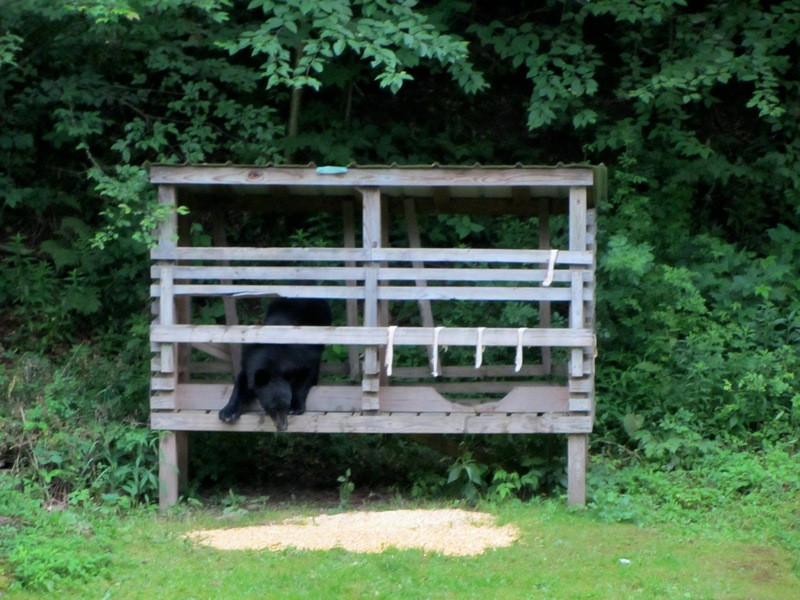 So it isn't as easy to see him as the other bears. The other two were a bit shyer and a lot smaller. I am guessing they weigh one to two hundred pounds compared to Snaggle Nose's five hundred pounds. As many of you regular readers will know Snaggle Nose lost part of his face in a fight with another bear about four years ago. This hasn't slowed him down and I wouldn't be surprised if some of the other bears in the pictures are his prodigy. If you click on the individual pictures they will get larger and you can see the detail Kim caught in the hummingbird's feathers. The picture of the Indigo Bunting looks like it could go on the cover of a bird magazine. 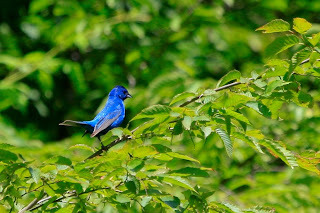 For any of you who love birds this is a great place to watch them in the summer months we have so many varieties of birds you don't see much in the city. Kim got quite a few good pictures during her only two days and I can't begin to show you all of them. But it is nice to see them as bright and detailed as I see them everyday, while I am Lost in Leetonia. Thanks again to Kim for letting me share these with you. Maybe she will come back next year and stay a bit longer. Mountain girl, Paula, logging out.